Every concrete contractor must have a complete set of tools to get the job done. Since concrete waits for no one, the right tools can make the difference between a successful pour and a potential disaster. Most of the essential tools are basic and do not require a significant investment. Owning these eliminates the cost of rental fees and the lost time picking up and returning the equipment. Some specialty equipment is more expensive and is worth the investment only if the tools are needed on a regular basis. Otherwise, it may be most cost-effective to rent specific items when they're needed. Screeds are long, straight, stiff tubing or boards used to smooth concrete shortly after it is poured. Screeds are available in different sizes and can even be project-specific, such as those used for building concrete bridges. For hand-screeding, the screed must be longer than the width of the concrete form so that the screed can "ride" along top edges of the form. Wheelbarrows are needed to move small amounts of concrete or to carry tools around the site. They are also useful for taking concrete samples for slump tests or other assessment. A portable mixer allows you to mix small amounts of concrete at the job site. Mixers come in handy for pours that are too small to warrant an order of ready-mix, and mixing by machine is much more efficient than mixing by hand in a wheelbarrow or mixing tub. Rubber gloves are always needed when handling concrete. Concrete contains chemicals and admixtures that can irritate skin. Cement in concrete draws moisture from the skin and can cause extensive damage over time. Rubber boots ensure you are prepared to step into concrete at any time. They allow you to work while standing in the concrete and at the same time protect you from skin irritation. Vapor barriers or retarders are used to stop moisture from evaporating from concrete surfaces, which weakens the concrete. Barriers also can be placed below the concrete before it is poured to prevent surface water from mixing with the concrete or to prevent dry base materials from pulling water out of the concrete. Concrete saws are used to cut control joints while the concrete is setting. Standard wood saws, such as circular saws and miter saws, are needed to cut parts for wood forms. Demo saws or chop saws are used to cut rebar or other metal reinforcement materials. Shovels are essential for moving small amounts of concrete around a pour to fill voids or depressions and to get to hard-to-reach areas. Shovels also are needed on-hand to remove excess concrete from overfilled forms. Most concrete contractors use square-ended shovels rather than rounded, garden-type versions. Groove cutters, or groovers, are used to create control joints on sidewalks, walkways, driveways, and residential slabs, where a concrete saw typically is not used. Many groovers have a horizontal plate with a vertical fin for cutting the groove. The plate often has rounded sides for shaping the edges of the groove. A laser level is now the standard (and preferred) tool for leveling forms and setting their elevation. They're also useful for establishing or checking the height of embedded pieces, like bolts and other anchors. Laser levels send a beam of light to provide a straight level or plumb line. Unlike a traditional string line, the laser line never gets in the way, and it can remain true over a long distance. A bucket or pail of water is handy for pours in very dry or humid conditions. 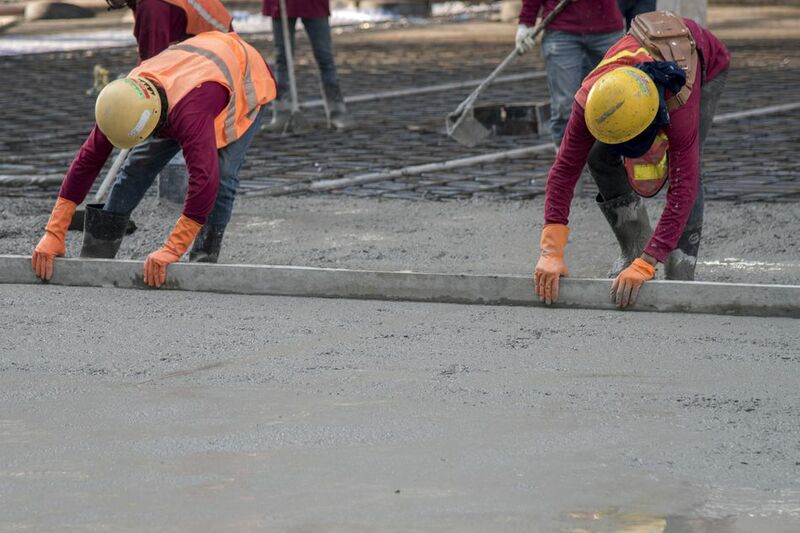 A small amount of water added during the finishing process makes the concrete more manageable. Rain, snow, or drainage can lead to concrete forms full of water. Bailing out water by hand can use up precious time before a pour. A water pump can get rid of the water much faster and with very little manpower.